CLICK this image and listen to the first story - Vic has a gorgeous patio on the back of his house. One part of the patio has sunken down. I've got the fix. DEAR MARCIA: Resurfacing concrete with an overlay over existing concrete surfaces is a fantastic way to extend the life of a driveway, sidewalk, patio or porch. Believe it or not, this is a great DIY project if you just practice first on a smaller concrete slab. The new surface will be durable and certainly more long lasting than the original finish if you diligently follow a few simple steps. The best part is that the material cost is minimal and you can do the work on different days to suit your schedule. I believe you can tackle this project if you take your time. The most important step in the process is to make sure that all loose concrete material is removed. Weak concrete can be removed by hand with a chisel and hammer or you can rent a lightweight demolition chipping hammer that blasts away material. CLICK HERE to get FREE & FAST BIDS from local concrete contractors that do overlays. This is a great demolition hammer tool to chip out rotten concrete. If you've got a bigger job that's going to last a few days, you should BUY one, keep it in good shape and then SELL it on Craigslist once done. This will be cheaper than renting one. CLICK THE IMAGE NOW TO BUY THIS GREAT POWER TOOL. I own one just like it. Industrial-strength power washers can also be used. The concentrated stream of water removes weak concrete. The surface that will receive the overlay must be clean, oil and dust free. Hold the wand close to the concrete at a low angle and use it much like a paint scraper trying to get the water jet spray under the thin layers of peeling concrete. Before you purchase the materials for the job you need to decide how thick the overlay will be. If the thickness will be 3/4 inch or less you will not need any small stone aggregate. The size of stone in concrete mixes is very critical. The maximum diameter of any stone in a concrete mix should never exceed 1/3 the thickness of the pour. Small pea gravel often has stones larger than 1/4 inch in diameter, thus it can only be used in overlays that are greater than 3/4 inch thick. Overlays can be as thin as 1/16th inch thick. In these instances you would use fine sand mixed with Portland cement. You can purchase these products already premixed in a bag or pail. You just need to add water. This is a resurfacer material that's premixed. You just follow the instructions on the label. Remember, it's just for THIN overlays. CLICK THE IMAGE NOW TO ORDER THIS PRODUCT. If you decide to mix your own, realize that sand purchased from a traditional gravel pit or building supply yard often is available in three grades: fine, medium and coarse. Coarse sand has very small stones in it that can be as large as 1/8 inch in diameter. This sand is perfect for one half to 3/4 inch thick overlays. For a thin overlay, you need to get fine sand. Before you mix any material you need to set up some small form boards. Use furring strips that are braced against the sides of the existing concrete work. The top of these pieces of lumber should be set at the final height of the overlay. It's not necessary to attach them to the existing slab. Simply drive stakes next to the furring strips to pinch them against the existing concrete work. Feel free to add another half measure of cement for an extra strong overlay. You should add enough water to the mix to make the mixture plastic. It should flow out of a wheelbarrow like pancake batter pours from a bowl. If you want to really make the overlay mixture sticky, then consider adding hydrated mason's lime to the overlay mixture. 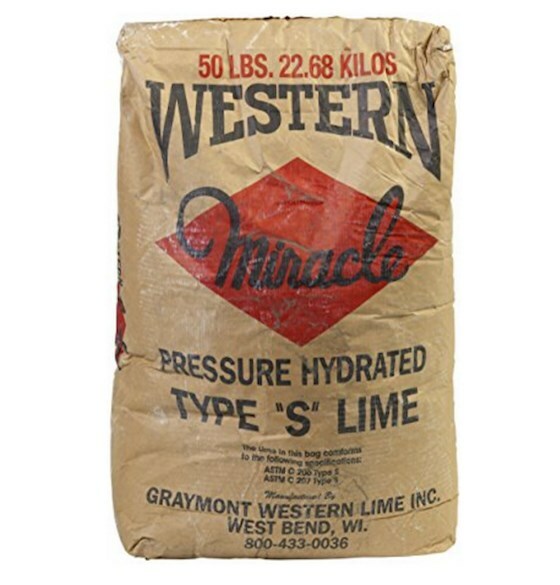 Lime is one of those magic ingredients that's rapidly becoming myth. This happens in construction. Some great methods and materials transform from history, to legend to myth. This is excellent hydrated lime. It's a fine white powder and it's going to look great on your home. CLICK THE IMAGE TO ORDER SOME RIGHT NOW. To permanently bond the overlay to the old concrete, apply a cement paint to the old concrete. This paint is made by simply mixing Portland cement and water until it is the consistency of paint. Don't allow the cement paint dry on the existing concrete. It must be covered with the overlay mix within minutes of being applied. Watch the first three minutes of this video to see how easy it is to mix cement paint. You just need a bag of pure Portland cement. The best weather to perform this work is when the temperatures are in the 50 - 60F range. Overcast days are ideal. You want the resurfacing to set up slowly. You apply your final finish to the overlay when the material is somewhat firm. IMPORTANT TIP: Don't sprinkle water on the surface as you finish it. This will weaken the top skin of concrete. Tightly cover the finish slab with plastic to cure it or spray a clear curing compound on it so that the overlay cures very slowly. This will allow the concrete to attain maximum strength. my aggregate porch is dull, I have put aggregate sealer with stain every year, but I would like something to finish it with that will last longer. I would apprecate any suggestions on how to improve the finish. Lots to discuss. This is why I have my 15-Minute Phone Consult. I have a large slab to resurface around 11X15 feet. 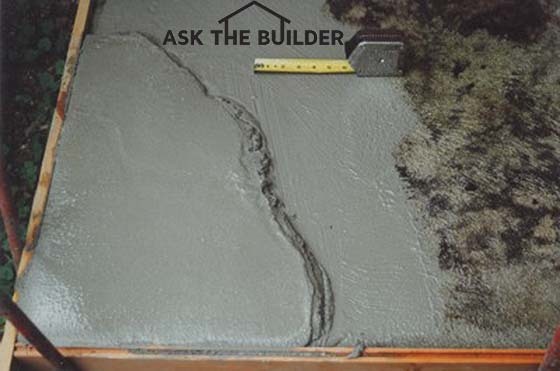 In your article you stated " Do not let the cement paint dry on the existing concrete. It must be covered with the overlay mix within minutes of being applied." How many minutes are you talking about ? Can I let the cement paste sit 20 minutes before adding the overlay? It can't dry. I can't estimate your drying time. Depends on sun, wind, temperature, etc. Have a helper applying the paint just before you spread out the overlay. Why do so many cement workers/contractors say a thin top coat, as you are suggesting here, is not possible? They ofter say that it will ultimately fail, crack, and peel off and most go further to recommend no less than a 3 to 4 inch minimum slab to insure against this? I am in a situation where what you are recommending here is preferable but at the same time I wish to insure it's success. Will additives such as a Masonry Bonding Agent help? Are you going to do it the way I say in the column above? If so, then you have your answer! Hi, This is my first post here but I hope someone can give me some advice. We had our parking pad paved and the work was very shotty. It is very rough and looks terrible. The contractor is offering to put a 1/2 inch top coat of Quikrete Sand mix and Concrete Acrylic Fortifier to smooth it out. I am worried that a 1/2 is not thick enough especially for a parking pad and that it would crack and/or pop up due to freezing. My question is, are my concerns justifed? Mr. Tim, We live South Western Georgia. 20 Year Concrete Drive...Solid but top cream coat is gone. In your videos and information regarding thin coat concrete over concrete paint, you do not mention best way to "spread" the top coat. If doing a thin top coat is it possible to actually use a paint style roller? What is preferred method? I have about 2800 square feet to do. Thank you for your time and considerations. Hello, I am going to be epoxy coating my floor and applying a gloss top coat. I have very minimal pitting in a few areas. I have also bought concrete resurfaced from quickcrete. Can I apply the resurfacer first and after it fully dries then apply the epoxy? If so is there a recommended finish I should put on the resurfacer to get the epoxy to bond with the resurfacer better(broom finish etc)? Thanks! I HAVE RECEIVED A REPLY RE MY CONCRETE DRIVEWAY - THANK YOU. I had 10 yrs old drive in good condition. Hired professionals to do power wash on driveway. I think he scrub my driveway so bad that now sand is keep coming off.What is solution to fix this issue? You just need to follow my instructions and put on a new 1/2-inch-thick overlay.